Ladera Highland Village is a 55+ community located in Northern Texas near the Dallas-Fort Worth metropolitan area. This brand new active adult community is being built by Integrity Group. 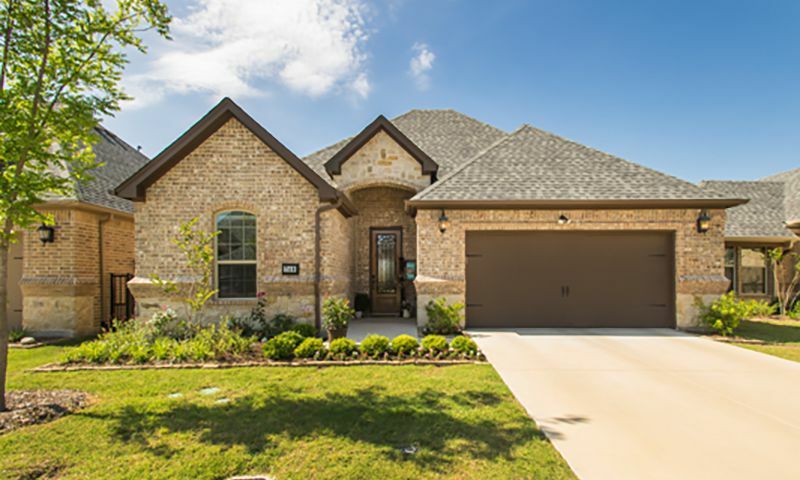 Ladera Highland Village offers six home models with desirable features, perfect for anyone who wants modern homes in a cozy, close-knit community in the rolling hills of Highland Village, Texas. A clubhouse is currently being built in this gated, age-restricted community. Homeowners will be able to gather there for physical recreation and social gatherings. Start an exercise routine in the fitness room or chat with neighbors in the community room. The terrific amenities will continue outdoors. Make the most of the enjoyable Northern Texas climate with an outdoor pool and patio accompanied by firepits. Walking and biking trails will weave throughout the community's 11.85 acres of parks and open space. There will also be a pickleball as well as a bocce ball court. Social areas will include a BBQ area, gazebo, and scenic ponds, making Ladera Highland Village a beautiful active adult community to call home. Integrity Group began construction of Ladera Highland Village in 2016 and it will contain approximately 100 homes upon completion. Ladera Highland Village will consist primarily of one-story, single-family homes featuring two bedrooms, two bathrooms, and an attached two-car garage. Homeowners will have the option of selecting a floorplan that will include a second floor, providing a third bedroom and bathroom. Seven semi-customizable floor plans are available, ranging in size from 1,654 to 2,513 square feet. Most models also include a den or study for additional living space. These energy-efficient homes also boast tray ceilings, crown molding, granite countertops, and stainless steel appliances. Living within Ladera Highland Village means taking advantage of the low-maintenance lifestyle. With the planned on-site amenities, Ladera Highland Village will provide residents with ways to stay active with bocce ball games as well as community BBQs. The homeowner's association will take care of all exterior maintenance, allowing homeowners to enjoy all that the beautiful community and area have to offer. Ladera Highland Village is located in the city of Highland Village in Northern Texas. Heading south on Village Parkway there is a major shopping center just over a mile away, complete with a Whole Foods Market, several restaurants, a twelve-screen multiplex, and a number of other stores and shops. This 55+ community is also conveniently located within four miles of Texas Health Presbyterian. Interstate 35E is just five miles away for traveling the area and when your next destination is farther, Dallas/Fort Worth International Airport is just 26 miles away. The city of Highland Village hosts a number of fun events every year. A hot air balloon festival sponsored by the local Lions Club is a major draw, as is the city's annual Celebrate Highland Village festival featuring fireworks, live music, a 5K run, and fishing events. Just to the north of Highland Village is the county seat of Denton, Texas, which boasts a historic town square and vibrant arts and music community. For those looking for an authentically Texan experience, the North Texas State Fair and Rodeo is held annually in Denton and draws visitors with livestock shows, live music and, of course, rodeo events. Ladera Highland Village will have the amenities, location, and homes to make it a terrific 55+ community in Highland Village, Texas. There are plenty of activities available in Ladera Highland Village. Here is a sample of some of the clubs, activities and classes offered here. Integrity Group began construction of Ladera Highland Village in 2016 and it will contain approximately 100 homes upon completion. Ladera Highland Village will consist primarily of one-story, single-family homes featuring two bedrooms, two bathrooms, and an attached two-car garage. Homeowners will have the option of selecting a floorplan that will include a second floor, providing a third bedroom and bathroom. Seven semi-customizable floor plans are available, ranging in size from 1,654 square feet to 2,513 square feet. Most models also include a den or study for additional living space. These energy-efficient homes also boast tray ceilings, crown molding, granite countertops, and stainless steel appliances. 55places.com is not affiliated with the developer(s) or homeowners association of Ladera Highland Village. The information you submit is distributed to a 55places.com Partner Agent, who is a licensed real estate agent. The information regarding Ladera Highland Village has not been verified or approved by the developer or homeowners association. Please verify all information prior to purchasing. 55places.com is not responsible for any errors regarding the information displayed on this website.